Happy Tuesday! I hope those of you in the United States enjoyed your Memorial Day weekend. We had unseasonably rainy weather, so we didn’t get out as much as we had hoped. It was kind of like a typical Memorial Day weekend in the Pacific Northwest! 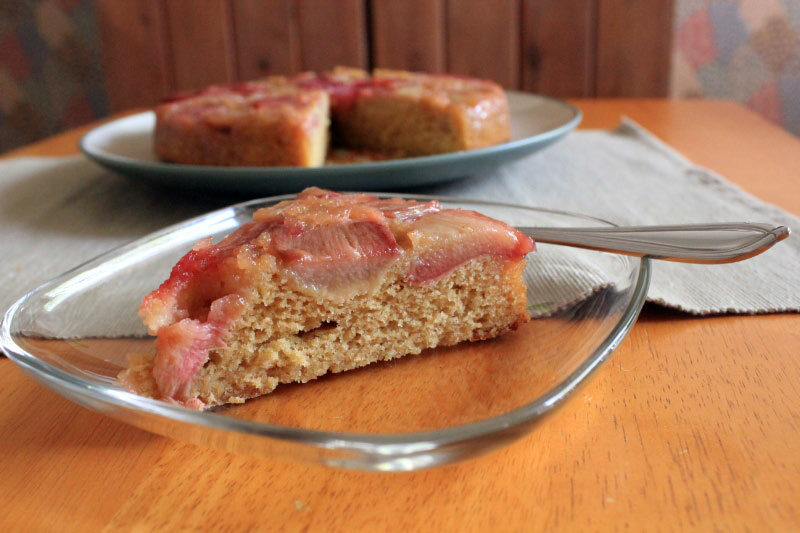 For Tuesdays with Dorie this week, we made a delicious cake called Rhubarb Upside-Down Brown Sugar Cake. I made it for my parents last weekend when they were here to babysit. This cake is exactly what the name suggests: an upside-down cake, with rhubarb in the fruit layer and a brown sugar-based cake. What makes this cake so good is that the rhubarb is sauteed in lightly caramelized sugar before being placed in the bottom of the cake pan. I went the simple route when serving my cake. I did not use the optional glaze, nor did I adorn the cake in any way. Dorie’s suggestions of whipped cream or crème fraîche and sliced strawberries would be wonderful. Vanilla ice cream would be good too. This cake was a huge hit! My parents love rhubarb desserts, so my Mom plans on making this one again. My daughter scarfed her serving down. I loved the flavor of the brown sugar cake with the sweet-tart rhubarb. The cake was moist, but light. A winner! They must have worked, because the cake was wonderful! Rhubarb is something I have hardly ever cooked with. For one thing, I used to not like it. Secondly, I have always considered rhubarb to be something you harvest from your garden, not buy from a store. (And of course I don’t grow rhubarb because I used to not like it). 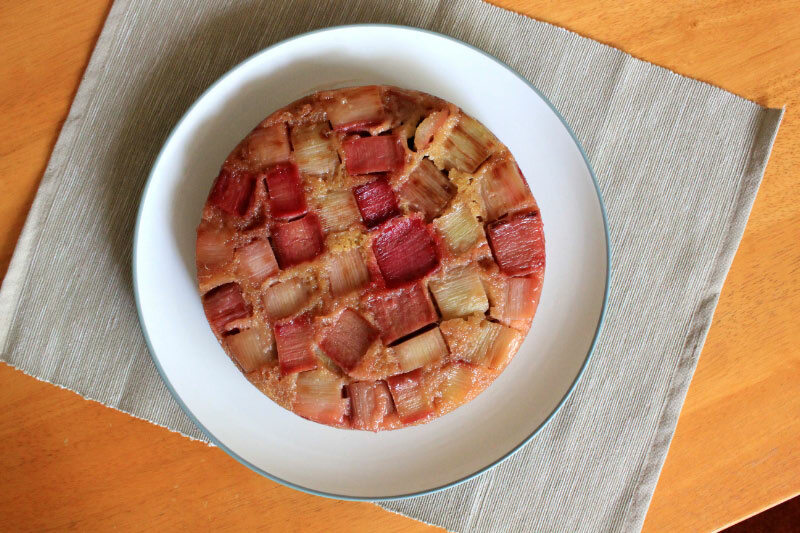 So I was excited to find out that this week’s French Fridays with Dorie recipe was Roasted Rhubarb. I would get to try something new! Making Roasted Rhubarb couldn’t be more simple. Simply toss cut up rhubarb with orange or lemon zest (I used lemon) and plenty of sugar. Cover with foil and roast for 15 – 20 minutes at 400°F. Uncover and roast another 5 minutes. (The actual recipe can be found in Dorie’s book Around My French Table on page 397). Because this recipe is essentially a sauce to be served as an accompaniment to other things, I got to decide how to serve it. I liked the idea of rhubarb shortcakes, but I also knew it would be good with vanilla ice cream, so I settled on “rhubarb shortcake sundaes”. I filled sweet biscuits with ice cream and topped it with the Roasted Rhubarb. The sweet biscuit I used came from Moosewood Restaurant Book of Desserts. It’s a simple, versatile, and delicious recipe. The biscuits were sturdy enough to hold the ice cream yet still had a tender bite. Oh, and by the way, I did actually make last week’s French Fridays recipe (Cola and Jam Spareribs), I just couldn’t find the time to write my post. I thought the ribs were delicious and I enjoyed the complex flavors. When I asked my husband what he thought of them he said, “They’re ribs!”, which apparently was a good thing. I will cook them a little less next time, but otherwise thought they were great! Cut the butter into small pieces. Return the butter to the refrigerator so it stays c0ld while you prepare the rest of the ingredients. Sift together the flour, sugar, baking powder, baking soda, and salt into a large bowl. Using a pastry cutter (or two knives), cut the butter into the flour mixture until it is crumbly and resembles a coarse meal. In a separate bowl, lightly beat the egg. Blend in the buttermilk and vanilla. Make a well in the center of the dry ingredients and pour the buttermilk mixture into it. Stir quickly until just combined. Turn the dough out onto a floured surface and knead gently, folding the dough over four or five times. (I found the dough to be very wet and sticky so I had to add quite a bit of flour). If necessary, lightly flour the surface again and flatten the dough to about a ½-inch thickness, using your hands or a rolling pin. Cut into rounds with a biscuit cutter and place on an unoiled baking sheet. Bake for 10 to 15 minutes, until golden brown.